What is Curb Appeal, And Why Should You Want it? Curb appeal, in the simplest terms, can be reduced to the attractiveness of your home when viewed from the street. It really reflects everything about the appearance of your home when you, or anyone else, is approaching it. There’s no single element to it; it’s the whole way of looking at the home. You’ve probably heard the saying “You never get a second chance to make a first impression.” Whenever we encounter something new – whether it’s meeting a new person, seeing a new sight, or encountering a new situation – it sticks with us. That first impression is always going to have some influence on us, no matter what happens later on, good or bad. When it comes to houses, it’s usually realtors who bring up the importance of curb appeal. They remind us that when we’re selling our home, that first impression plays a huge role in how a prospective buyer will view the property. If the prospect is turned off as soon as they pull up, it’s going to be hard to bring them back around. But we also want our home to look good for any guest we may have. When friends or family come to visit, we want them to feel comfortable right from the start. Creating a welcoming and beautiful appearance goes a long way in improving how others think of us. But these are only occasional, right? You’re only going to sell any particular home once. You don’t always have visitors. But think about the effect that a good-looking approach to your house can have on you! A well-maintained and pleasant-looking house can put you more at ease when you come home from work, from a trip to the store, or from any other time away. So what all goes into curb appeal? Let’s try to be as comprehensive as possible, but every home is going to have its own elements to take into account. The central point of making the first view of your house a good one is of course the house itself. You may not be able to do much about the architecture itself, but you can make sure it is well maintained. The easiest way to do this is making sure the paint job is fresh and the colors look bright. Whether the whole house gets painted or just the trim, it’s important to keep things looking good. Other elements to consider are your windows and door. Adding a little trim or decoration to them goes a long way to creating a more lived-in feel. One example would be adding external shutters beside the windows. They don’t have to be functional – they can be hung in place and serve to help break up a long wall. Curtains, shades, or other window hangings that serve mainly for the inside also serve to make the house look better from the outside. 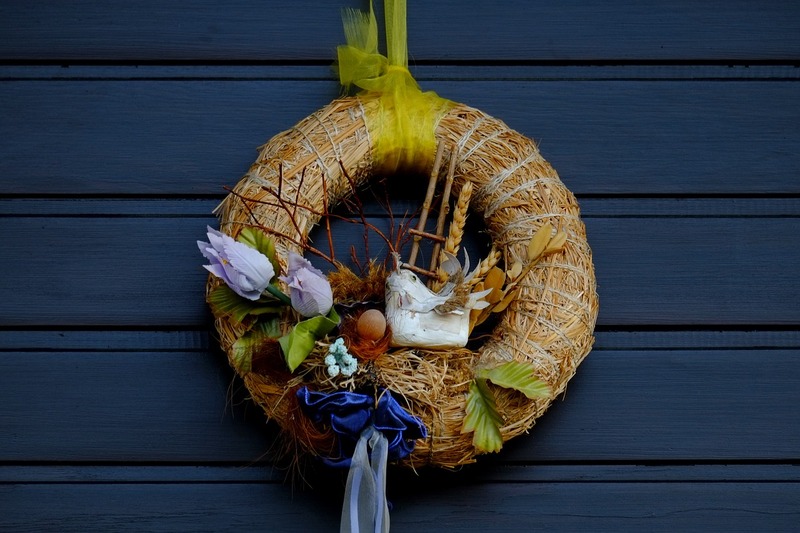 Simple decorations such as a seasonal wreath on the door add color and charm. Another good choice is a house flag hanging from the door or beside the entryway. Finally, proper lighting can go a long way to making a house seem welcoming. This isn’t limited to just the building itself – it can be part of your landscaping as well. But a lack of lights says “you’re not wanted here” and can make visitors feel unsafe. Lights above the driveway and garage doors and at the entryway make the home more inviting and provide a feeling of greater security. How the area in front of your house looks is another big factor in how much appeal your home has from the curb. Having a well-manicured lawn is a necessity. That means, as a minimum, to keep the grass trimmed regularly, weeds pulled, and any trash picked up. Also, if you have any trees in front of the house, make sure fallen leaves are cleaned up and the trees are trimmed back appropriately. Of course, be sure that any dead branches are removed – they’re not only unsightly but also dangerous to your property and more importantly, to you and your family. Flower beds are one option for decorating, and you may have a variety of places to have them depending on your property’s layout. They look great along the curb of the street, along your driveway, or adjacent to the walls of your house. Flowers add color and a sense of diversity and life to the front of the house. If flower beds aren’t practical, you could also choose to have potted plants. Another great substitute is a couple of stylish pots on the front steps, along the driveway, under the mailbox, or elsewhere. Another, perhaps longer-lasting, option is the use of bushes or trees. Some bushes can even be right up against the house. Having some along the driveway or at the front of the property can be attractive while also giving a bit of privacy. Trees or bushes can also serve as a windbreak or provide shade – both of which can help with your energy expenses. Read up on what some experts had to say about curb appeal! Hardscaping is another element that really helps create a great sense of beauty and style for the front of your home. “Hardscaping” could really be considered a subset of landscaping. It refers to all the man-made elements involved – the driveway walkways, any walls, or other elements that have been built. These are primarily practical elements – places to park and to walk without getting muddy. Maybe there is a retaining wall. While other elements can be added that are purely ornamental, most in this category serve a purpose other than simple beautification. That doesn’t mean they can’t be beautiful as well. There’s no need to settle for a drab surface like plain concrete or asphalt. Instead, you can choose something that adds to the beauty of your home, such as stamped concrete. These solid surfaces can go a long way to complementing both your home’s architecture and its colors. And since they usually stretch from the street right up to the front door, they also let visitors feel welcome to approach. When doing your landscaping, you might also want to keep in mind important aspects of the security of your property. How do these fit together? Well, there are lots of elements that can help or hinder your safety. We’ve already mentioned the importance of proper lighting. But this doesn’t just make it easier for you to find the keyhole or avoiding tripping on your way to the door. It’s also a great deterrent to keep thieves away. Lights that stay on all night or those that are motion activated are one way to keep people with bad intentions away. Another suggestion is to be careful about the size and position of your plants, especially bushes. While they look beautiful, if not arranged correctly they could become hiding places for assailants. Keeping the plants and bushes trimmed and away from windows is a good way to prevent them from being used for less-than-honest purposes. Use common sense when layout out your plants and other parts of your lawn. While it might be tempting to concentrate just on how great it may look, it’s still possible to have a fantastic space while not creating danger along the way. You want your home to look great right from the first time it’s seen. It’s great when you want to sell, but it also is appreciated by your visitors and neighbors. And it can even make you feel better about coming home and enjoying your time there. Improving your curb appeal can work miracles for how others – and you – feel about your house. Working to spruce things up a bit, from the building itself to the plants and surfaces you have, goes a long way to making a house into a home!